Ready to see what was in August’s Mystery Chocolate Box? 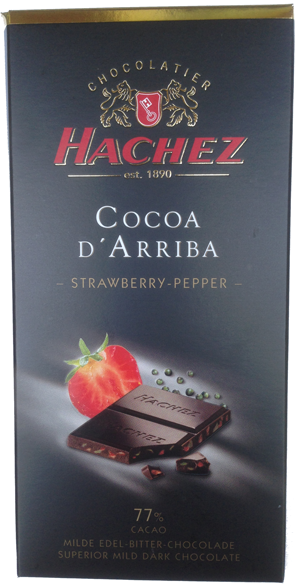 This bar features dark chocolate with a fruit that isn’t widely paired with chocolate, but it is actually a great combination. The quality of the chocolate in this bar is fantastic — it’s single-origin organic cacao made in small batches…great stuff! This was an interesting bar. The flavors in it aren’t quite as strong as you might think (especially once you see what they are), so it’s a little harder to guess than it could have been. Bite into this bar and you get a big taste of the smooth milk chocolate…then the crunch…then more milk chocolate…then more crunch…then they finally mix together and you get a delightful milk chocolatey crunch that gives off a hint of caramel. The thing that’s nice about this bar is even though it’s topped with espresso beans, there isn’t a super strong coffee taste, so if you don’t like coffee you still might like this bar. Oh, and it’s great if you need a little pick me up! What did you think? We’d love to hear your thoughts on this box. Oh, and, look forward to September’s box…we’ll be revealing our new wrapper design! No Replies to "August 2015"